Attention to details, colors, and traditional but at the same time lively and fresh furniture, are some of the features of this spacious villa, ideal for large groups thanks to the indoor and outdoor big and comfortable spaces. A lovely path, surrounded by a large garden will lead you to the house developed on two floors: at the ground floor there is a large living room with fireplace, sofa bed for two persons and dining area; an air-conditioned bedroom with double bed and bunk beds; a bathroom with shower; a lovely kitchen equipped with everything you need (stove, dishwasher, two refrigerators) that overlooks the outdoor space and the barbecue area equipped with a wood oven perfect for cooking pizza, sink, table and chairs and also a large veranda divided into a relax area and dining one. On the first floor there are a bedroom with two single beds and ceiling fan; one double air-conditioned double bedroom with a private balcony with view on the entrance and en suite bathroom; another double with air conditioning, en suite bathroom and large balcony overlooking the other side of the villa; a third double bedroom and an additional bathroom. This beautiful house is also provided with private parking, free WiFi, iron&board, washing machine and dishwasher, television and DVD player, to ensure guests maximum comfort. 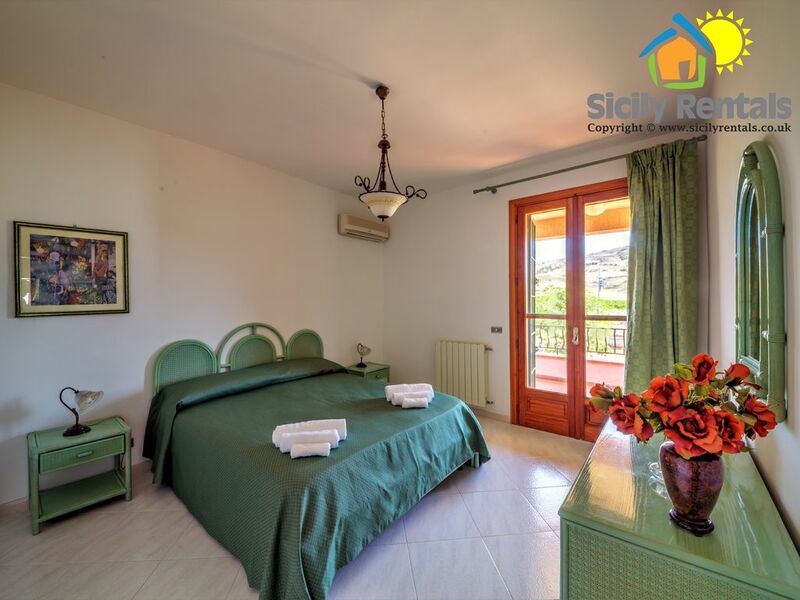 Its location will also allow you to enjoy both historical sites and amazing places of natural beauty and, thanks to the nearby restaurant (about 100 meters) you will experience the tasty Sicilian food! The villa was perfect for our group of 8. it was clean and well maintained. We had everything we needed and more. The owners were very welcoming and gave us a basket of food to get us started which included homemade jam! Very close to the main roads and a beautiful beach is a short drive away. We just had a lovely stay in Villa Mary. We were two families with small children and was a perfect size to spread out in. It's just down the road from the beautiful beach at Eraclea Minoa. We had a lovely meal there at Lido Garibaldi. There's also a nice restaurant opposite that we used for take out pizza. My family and in-laws (total of eight) stayed for 3 nites, and we loved the home and the attention given to us. The home was very clean and well-appointed. Ask about the great woodwork throughout it. Six of us enjoyed a lovely break here, the villa is well furnished, very clean and generously supplied with everything, which was super. The hosts are wonderful, very friendly and helpful, every help was provided from the moment we booked, we felt very cared for. Thank you, Giacomo and team for a wonderful few days. Io e i miei amici, in totale 15 persone fra ragazzi e adulti, siamo stati in questa fantastica villa per 12 giorni e che dire, ci siamo trovati divinamente, non è facile trovare case così ben tenute con tutto il necessario per un soggiorno tranquillo per non dire della pulizia, veramente eccezionale. Un grazie particolare ai signori Tallo che ci hanno accolto e ci hanno fatto sentire a casa dandoci delle dritte per gli acquisti e per gustare i piatti tipici del posto. Consiglio vivamente la Villa Mary a tutti non resterete delusi. Dieses Haus ist sehr zu empfehlen, wir waren mit zwei Familien dort und Platz war mehr als genug! Ein sehr schöner Außenbereich mit Außendusche, Pizzaofen, Grill und großzügige Veranda. Innen auch wunderschön und großzügig geschnitten. Der Strand ist nicht weit entfernt und auch die Tempel von Agrigento, oder die Keramikstadt Scaccia, sollten einmal besucht werden. Es lohnt sich!! Die Vermieter Signore Tallo und seine Frau sind sehr sehr nett! Wir kommen von der anderen Seite der Insel und fahren dort sehr oft hin um die Familie zu besuchen und wollten diesmal auf dieser Seite Urlaub machen und es hat sich gelohnt! Wir würden das Haus sehr gerne wieder mieten!! Es ist wirklich zu empfehlen!!! The area is surrounded by gorgeous, uncontaminated and also unknown beach places; their long, white, sandy beaches will take your breath away! Some of them are natural reserves thanks to their beauty and their wildlife conservation.